PlanetHoster excels in the areas of performance and safety, as well as the efficiency of our technical support team. We develop real relationships with our clients. We combine the expertise of our staff and support team with the latest technologies to give you a truly unique service. PlanetHoster provides web hosting, domain name registration, SSL Certificates and various other web solutions. We have our own redundant IP network to ensure all hosted sites and servers remain available at all times. We serve more than 60,000 customers using our HybridCloud infrastructure, which is distributed over our facilities in France and Canada. We proudly serve more than 100,000 websites in North America and Europe using state-of-the-art technology including Anti-DDOS protection and Anycast DNS for redundancy. PlanetHoster wholly owns its infrastructure worldwide. Our accreditation with ICANN adds to our growing list of accreditations, including those of CIRA, AFNIC, Dnsbe, Dnslu, Eurid, ldns and Switch. We specialize in turnkey solutions, and our experienced team of web hosting professionals is committed to providing high-quality service to our clients. Our head office is located in Laval (greater Montreal), Quebec, Canada. 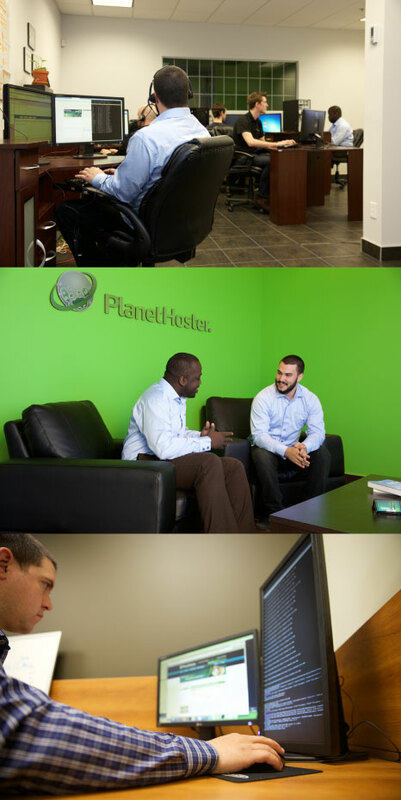 Founded in 2007, PlanetHoster provides full management of its operations. Through its accreditations, PlanetHoster is the customer's immediate domain name registrar. We offer a direct contact with authorities in the event of any domain name disputes. PlanetHoster also serves customers through its state-of-the-art facilities, which are managed entirely in-house. Last but not least, technical support is provided by qualified and experienced PlanetHoster technicians. We offer quality service from beginning to end. Since the beginning, our main objective has been to provide the latest technologies along with the expertise of our technicians in a single, easy-to-use solution. Throughout the years, our priorities have not changed. PlanetHoster’s emphasis remains on the friendliness and efficiency of our technical support team, which offers a unique service in the industry. Our satisfaction rate is over 94% across our customer base in North America and Europe. Our Data centers rely on renewable energy. Our offices have a strong recycling policy. 24/7 support. No outsourcing. Local qualified and experienced technicians. Insurance again errors and omissions protects you for up to $ 2,000,000 per incident. We offer financing plans for complex deployments. Partnerships with Symantec and Let's Encrypt enables us to offer the best SSL solutions on the market. We are always focused on innovation. We launch many R&D programs each year. Multiple and flexible payments options. We use LiteSpeed and MariaDB which gets you up to 9 times better performance than our competitors. 7-day satisfaction guaranteed policy, or we will refund you. Free migration with all our managed HybridCloud solutions. Loyalty program: All our customers receive 2% cash-back in PlanetHoster credit every 3 months. Affiliate program: 25% commission on sales you refer. Our partnership with Dareboost gives you free SEO tools. Easy to use control panel and video tutorials. Included auto installer for WordPress, PrestaShop, Drupal, etc. Infrastructure on two continents. Four locations to serve you. Two in Canada and two in France. Deployment of new high availability SAN (SC9000) in partnership with Dell. Optimized and redundant network offering you 99.999% uptime. VPS: 99.99% / Hybrid hosting: 99.9%. Double anti-malware protection with clamAV and PlanetHoster's own anti-malware suite. Double authentication system using Google Authenticator protects your login (optional). All our servers are protected against brute force attacks. Our Data centers are certified: TIER III, ISO9001:2008, ISO50001:2011, ISAE3402 and PCI-DSS certifications. Daily backups of your files and databases with R1Soft tools. Server customization available. For example: Varnish, Percona, Ruby, and more. Possibility to choose your own PHP, Ruby, Python and Node.js versions. Customizable php.ini for your PHP sites. PHP7, HTTP/2, OPcache/Xcache give your site the edge. FTP and WebDav file transfer. SPF/DKIM (secure emails) for email newsletters. CRON, postgreSQL, mod_rewite and website statistics are all available. All servers use mod_security/WAF so you don't have to configure a firewall.